Raza Ahmad, known as Raza Rumi, is a Pakistan-based writer and a public policy specialist, as well as a research fellow at Georgetown University's Berkley Center. 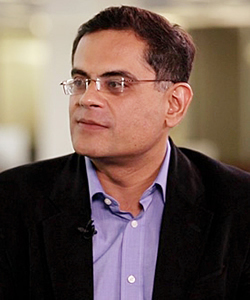 The editor of the Friday Times, he frequently contributes to Pakistani and other regional media, including the Express Tribune and the Hindu. He is also a senior research fellow at the Jinnah Institute, a public policy think tank in Pakistan, and a senior fellow at the United States Institute of Peace; he hosted the Express News show Khabar Se Agay. His expertise is in security, justice and counter-terrorism, public policy, governance, decentralization, capacity development, and change management. He has previously worked in international development, holding positions at the Asian Development Bank, the United Nations Mission in Kosovo, and the Government of Pakistan's Administrative Service. He holds a bachelor's degree from Government College University, Lahore and a master's degree from the London School of Economics.